And, lastly, the incredible health benefits that come from orchard fruits themselves — nutritionally and medicinally! Read on to learn about 5 key orchard plants that provide incredible health benefits for caretakers and harvesters all throughout the city! Please also read our edible plants disclaimer at the end of the article before consuming any parts of the fruits or plants described below. The fruit of chokeberries or aronia are known for their high levels of antioxidents! Native to the eastern United States, black chokeberries (or Aronia berries, as they’re sometimes called) are astringent, dark-purple fruits that grow on a compact 3 to 5 ft tall and wide, cold-hardy shrub. Belonging to the rose or Rosaceae family, this shrub grows well in full sun to partial shade in most well-drained soils, is drought tolerant, and ready to harvest in July and August, sometimes as late as September. 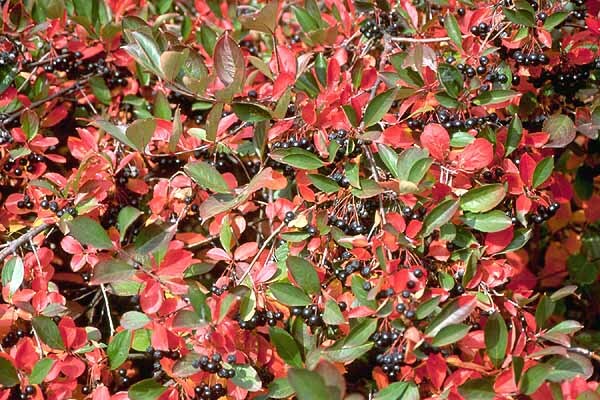 The shrub produces brilliant red foliage in the fall and has few pest and disease issues. Learn more about this incredible shrub, here. Chokeberries pack an incredible nutritive and medicinal punch – possessing the highest level of antioxidants among any temperate fruit species! Additionally, the phenolic (anthocyanin) compounds in the fruit contains anti-inflammatory, blood thinning properties, as well as acting as an anxiolytic (helpful for reducing anxiety) and as a liver protectant. Chokeberries are astringent directly off the bush, so generally processed before eating. To enjoy, consider making a fresh juice from the fruits, incorporating them into smoothies, or baked goods, or making a medicinal syrup. Blueberries are delicious but also full of vitamins and anthocyanins! The highbush blueberry, which comes from the heath or Ericaceae family, are deciduous, bush-grown, round blue fruits with a sweet, seedy and lightly sour flavor profile. Blueberries are native to neighboring New Jersey, where the acidic soils from the pine-lands produce well-formed and flavored fruit. 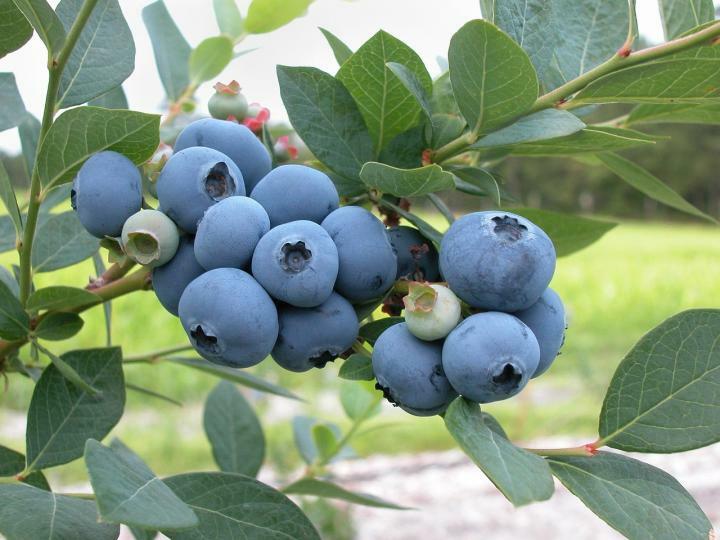 In order to thrive in POP’s community orchards, blueberry shrubs require full sun or partial shade, well-draining and highly acidic soils with a soil pH between 4 and 5 and can reach up to 4-6 feet high and wide. Planting sites in more naturally alkaline soils are best amended with peat moss, sulfur, or pine-needle mulching. Blueberries ripen late July to mid-August; but beware! This well-loved fruit of birds may require some protective netting if you are anticipating plucking your own, fresh and sun-ripened! Blueberries are low-calorie, nutrient dense fruits that are high in fiber and rich in the chemical compound, anthocyanin, the deep blue and purple pigment found in many health-supporting fruits. Blueberries are a rich source of vitamin C, K, B6, folate, potassium, copper, and manganese. Being rich in calcium, iron, and magnesium, phosphorous, manganese, and vitamin K, blueberries help improve bone health and elasticity of joints, muscle and arteries. The abundance of vitamin C in the fruit helps build collagen, helping to foster healthy skin and prevent oxidative DNA damage. The fruit also helps dissolve LDL cholesterol and helps strengthen cardiac muscles and reduce blood pressure. Enjoy blueberries fresh, out of hand, in your favorite fruit salad, cooked grain porridge, or as a juice, or jam! Elderberries have strong medicinal value in supporting both the immune system and respiratory health. Elderberries are native to much of Europe and parts of North America and produces deep purple drupe fruits in mid-July to early September. The musky sweet fruits of this hedgegrow shrub are best eaten after cooking, as the raw fruit contains a mild toxin that can cause digestive upset. Elderberries belong to the moschatel or Adoxaceae family, reach heights and width of 8 to 15 feet, and are extremely easy to care for — with their only true preference being that for full sun and well-draining soil. In their natural habitat, they grow along water banks and at the forest edges. Elderberries require little pruning, their pithy stems become fragile when dead and clip away easily at the base. Elderberries are an incredible health tonic that’s become quite popular in folk and herbal medicine for their rich supply of anthocyanins — (notice a theme here with these dark-pigmented fruits?) which help to boost the body’s inherent immune system functioning and to prevent viruses from replicating in the body. Decoctions (hot water extraction of the fruit) has also been used to assisting in soothing upper respiratory infections, allergies, gastric upset, cystitis, bladder and urinary infections. Enjoy fully ripe elderberries processed into jellies, wines, or syrups. The berries freeze well, too, for long-term storage and later use! In addition to producing nutritionally powerful fruit, elderberries also produce edible, cream-white flowers in early spring that can be harvested away from their clusters for use in soothing teas that can help break fever and soothe away itchy, red rashes of the skin or eyes. Did you know that both peach leaves and fruit have medicinal uses? 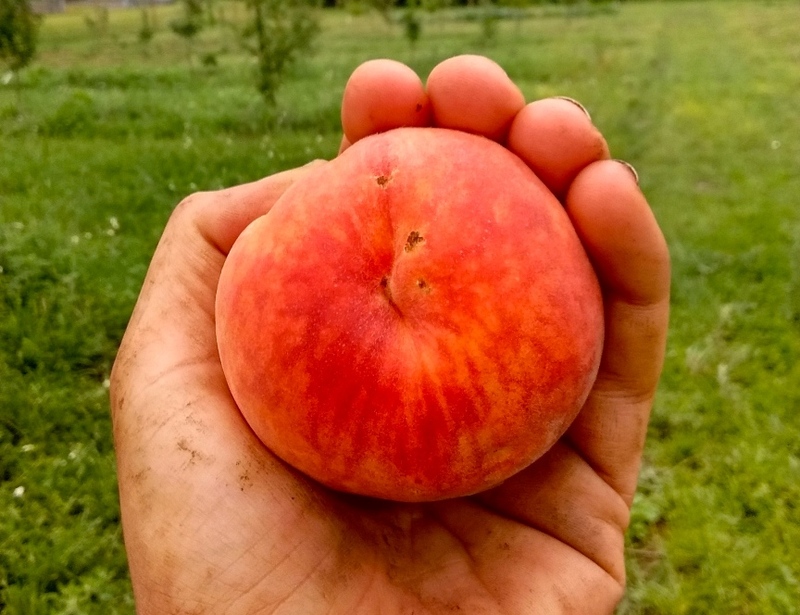 Like apples, pears, almonds, cherries, hawthorns, chokeberries and other common well-loved fruit, the sweet, juicy peach comes from the rose or Rosaceae family. Cultivated peach trees are generally maintained at 15 to 20 feet in height. These vigorous growers do best in medium (loamy) soils, and full sun in order to produce well-formed fruit. This deciduous tree flowers in the month of April and should be pruned during or shortly after bloom. Fruits ripen when the flesh is tender to the touch in July or August. Learn more about the peach tree, here. Peaches boast a number of health benefits being high in vitamin C (one fruit contains up to 15% of the daily recommended value of vitamin C), vision-supporting beta-carotene, fiber, and vitamin E. As such, the fruit can help with bladder, lung, stomach, and bowel issues. Additionally, this fruit is said to improve irritability, agitation, upset stomach, nausea, anxiety, restlessness, and morning sickness. Cold infusions of the chopped green leaves are also an incredible folk tonic for soothing a sour stomach and soothing the nervous system. Topically, the leaf and fruit has been used to lessen insect stings and sun or heat burns. Whether you eat them fresh out of hand with the juices dripping down your arm, or baked into a pie, jam, or cobbler, peaches will have you feeling peachy keen! The association of apples with good health is supported by a wide range of nutritional and medicinal value. Apples have a reputation for being one of the healthiest fruits — a rich source of fiber, vitamins, and minerals. 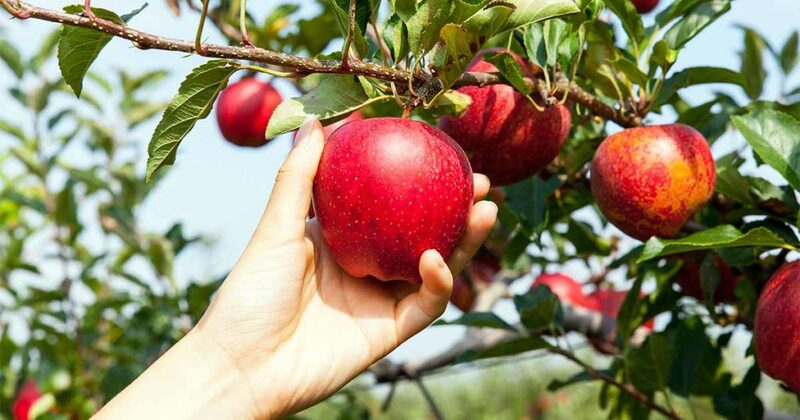 Originating in central Asia, apple trees are now cultivated globally. Depending on the rootstock, they can grow to be anywhere from 6-10 ft tall and wide on a dwarf rootstock, 10-18 ft tall and wide on a semi-dwarf rootstock, and 18-25 ft tall and wide on a standard rootstock. This deciduous tree belongs to the rose or Rosaceae family, like some of the other fruits in this round-up; it generally flowers in April and ripens late August to October depending on the variety. Apples and can survive in a variety of climates, however full sun is best for apple production. Learn more about apples, here. A 2006 study published in the Journal Experimental Biology & Medicine found that quercetin, one of the antioxidants fond abundantly in apples, was one of the two compounds that helped reduce cellular death caused by oxidation and neurological inflammation. That journal also found that juice from apples may increase neurotransmitter acetylcholine, responsible for memory. In addition to those incredible findings, the fruit has also been found to be high fiber, vitamin C, B-complex vitamins, minerals calcium, potassium, and phosphorous, pectin as well as malic acid, which help with digestion and kidney stone prevention. The flesh of the fruit is also said to help whiten teeth. The leaves of this fruit contain anti-bacterial phloretin, which is found to aid in inhibiting E.coli, Staph, and lessen colon inflammation. Apples can be enjoyed raw, cooked, baked into pies, cobblers, cakes, jammed, and buttered, pressed into cider, or fermented into hard cider. The possibilities are limitless! So, next time you’re in an orchard, consider this useful knowledge, and enjoy the many health benefits of these delicious fruits! The Philadelphia Orchard Project stresses that you should not consume parts of any edible plants, herbs, weeds, trees,​ or bushes until you have verified with your health professional that they are safe for you. As with any new foods that you wish to try, it is best to introduce them slowly into your diet in small amounts. This POP Blog Post was drafted by Development Assistant Natalie Agoos with content contribution from POP Education Director Alyssa Schimmel.